Good. Light wear to boards with a stain. Content is clean with marks. Good DJ with some edge wear, fading, a stain, a sticker on the back and is price clipped. Very Good. 352 p. First published in the 1970s to great critical acclaim Richard Olney's Simple French Food follows in the tradition of the writing of Elizabeth David and Jane Grigson, and Grub Street are re-issuing this classic work in the same format and size as Elizabeth David Classics and Charcuterie and French Pork Cookery. New. 2003. Hardcover. In this book, Olney gives us the best of cuisine bourgeoise: the food that is cooked daily in French households where the tradition of eating well has never been lost. His recipes include hearty soups, vegetable gratins, terrines, pates, fish stews, ragouts, daubes, and sweet tartes. Num Pages: 352 pages. BIC Classification: WBN. Category: (G) General (US: Trade). Dimension: 205 x 134 x 28. Weight in Grams: 530......We ship daily from our Bookshop. Like many people I think Olney's book is one of the very best cookery books available. I've had a copy for many years and its falling apart. 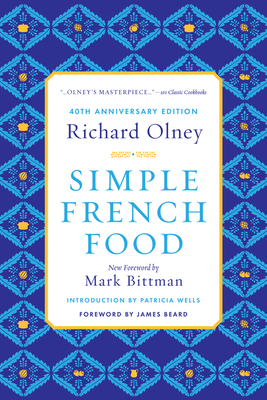 Simple French Food is well written in an engaging style, and Olney not only communicates how to prepare food well and with respect, he often imparts why a particular dish is historically important. Many modern celebrity chefs owe their fame to rewriting Olney's work as their own. Everyone should own and use this book. That's all I have to say!!! all of his books are so worthwhile that you cannot go wrong with any of them! If you are interested in the selection, preparation and presentation of food this book is both efficient and thorough. Olney draws distinctions between simplest and classic dishes, and gives wonderful surround to the recipes. I made his rabbit with red wine, and found it excellent. This is much more than just a French cookbook.